“Professors who rock” is an ongoing series about MMCC professors, adjunct faculty, administrators and staff who spend their free time as a part of the local music scene. It isn’t very often that you have a teacher who changes your whole world a bit. I feel like I have said this about almost all of the instructors that I had during my time at MMCC. Barry Alford and Chuck Bowden are the two that come to mind. I ended up taking as many of Alford’s courses as I could. I will have Bowden this semester and cannot wait. I am getting ready to graduate from MMCC in the winter semester, and only need a few more random classes so I decided that I would take it “easy” this summer and take a History of Rock ‘n’ Roll class. It ended up being one of the best decisions I have made as of late. It was not “easy” at all and required a lot of attention and listening to music, then writing papers about the songs. Mike Johnston was the instructor. 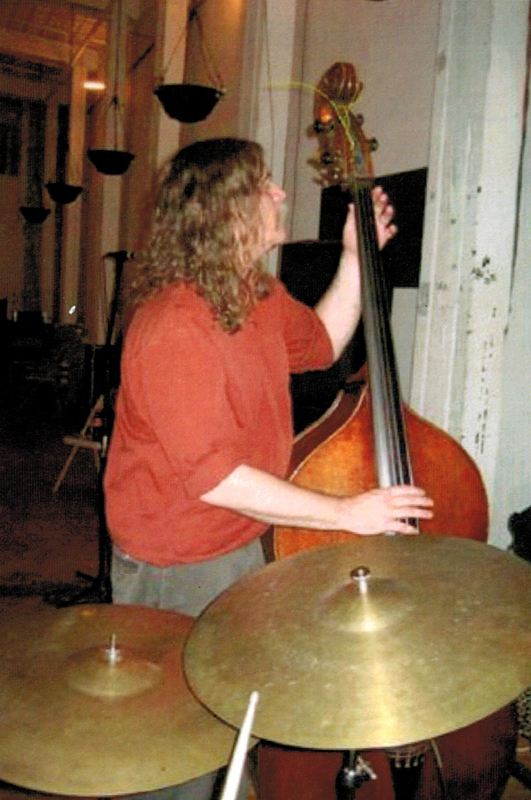 I had known Johnston over the years, seen him play with the Northwood Improvisers jazz ensemble. He plays the upright bass, which is quite possibly one of the coolest instruments ever. I knew him from this record store that used to be in Mt. Pleasant called New Moon. He also hosts a show on the local NPR/WCMU station on Sunday at 11 p.m. called Destination Out. I highly recommend listening to this show. I think that his teaching style reflects his radio show as well. “On the radio, sharing music with people who are into it, that’s my purpose on the planet,” Johnston says. Taking the class I didn’t really know what I was getting into. It required a lot of writing, and listening but it changed my world. You can tell that Johnston’s love for teaching comes from his love of sharing music, and getting people to listen to new things. “Music is about communication. It’s not local, it’s not regional, it’s universal,” Johnston explains. He integrates both audio and visual into the class. Also teaching the History of Jazz at MMCC, this class is constructed much of the way the History of Rock works. Teaming up with another instructor at MMCC, Johnston also teaches the music and art of the Asian Studies course MMCC offers. One of the best times he says he has had with the Northwoods Improvisers is getting the chance to play with Faruq Z. Bey, who passed away in 2012. Johnston played with Bey for 12 years. Johnston can’t say enough about how Bey has affected his life. “He was just a really great human being,” he remembers. “It was beyond a privilege to play with this man.” Johnston says he considers Bey one of the great Michigan jazz artists. Below is a youtube link to see Johnston and Bey preforming together. I couldn’t agree more. I personally feel like it was a privilege to have been taught by Johnston. His astounding love and passion for music is something that should be taught, nay, required in higher education today. Johnston makes you feel like music is just as important as any other area of education. “Your identity is wrapped up in the music that you listen to,” he says.